By the early 1530s the abbot was paying procurement fees to the bishop for Burton, Abbots Bromley, and Mickleover as well as for Ilam and Austrey; he also paid similar fees to the archdeacon for Abbots Bromley and to the bishop for visitations of the abbey. 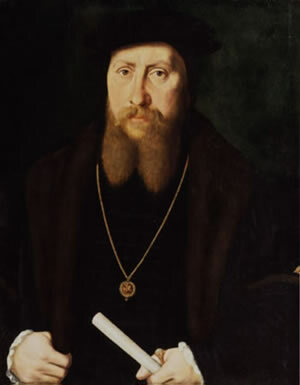 Although there was general fear for the future of major religious establishments as Henry VIII wrangled with the pope over his ‘Great Matter’, this was temporarily overshadowed by the election of a new Burton abbot in 1533 following the promotion of the current Abbot de Bronston to Abbot of Westminster. This caused some excitement because it was the highest office ever attained by any monk of Burton. Bishop Lee, under instructions from Thomas Cromwell, went to Burton in June with Richard Strete, Archdeacon of Derby, and David Pole, the vicar general, and “so sped the election” that the community agreed to leave the choice of a new abbot to the bishop and the archdeacon, stipulating only that one of themselves should be chosen before the 1st August. Cromwell’s original candidate seems to have been ‘the monk Baylye’, but William Edys, the ‘third prior’, was actually appointed. 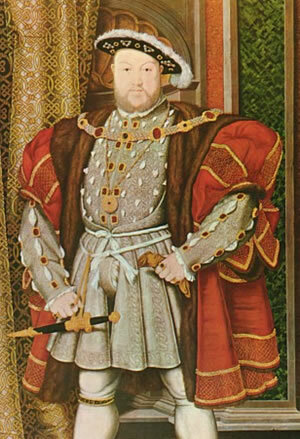 By 1536, Henry was installed as Head of the Church of England and had laws, now known as the first dissolution, had been enacted to allow the King to seize any church building with an income of less than £200. Many were confiscated. Some were pillaged and destroyed, other smaller ones were turned into graineries, barns and stables. Early in 1538 Francis, Lord Hastings, wrote to Thomas Cromwell to point out that Burton Abbey “lay very conveniently” for him, adding that he would have asked for it earlier but for an attack of measles. Later the same year the Crown tried to secure the tithes of Austrey for a royal official, but the abbot replied to Cromwell that the income was “so necessary to our house that we cannot do without it”. The Abbey was the centre of life in Burton; it was also a place of pilgramage to the shrine of Saint Modwen and received around £2 per year in offerings. The suppression of ‘Idolatry’ (worship of false idols) was one of the leverages used by the crown. Right honourable my inespecial good lord, according to my bounden duty and the tenor of your lordship’s letter lately to me directed, I have sent unto your good lordship by this bearer, my brother Francis Bassett, the images of St Anne of Buxton and St Modwen of Burton upon Trent which images I did take from the places where they did stand, and brought them to my own house within 48 hours after contemplation of your said lordship’s letter, in as sober manner as my little and rude wits would serve me. And for that there should no more idolatry and superstition be there used I did not only deface the tabernacles and places, where they stand but also did take away the crutches, shirts and sheets with wax offered, being things that did allure and intice the ignorant people to the said offerings, also giving the keepers of both places admonition and charge that no more offerings should be made in those places till the King’s pleasure and your lordships be further known in that behalf. My lord, I have locked up and sealed the baths and wells at Buxton and none shall enter to wash them till your lordship’s pleasure be further known. Whereof I beseech your lordship that I may be ascertained again at your pleasure and I shall not fail to execute your lordship’s commandment to the uttermost of my little witt and power. And the trust that they did put in those images and the vanity of the things, this bearer, my brother can tell your lordship better at large than I can write for he was with me at the doing of all and in all places, as knoweth good Jesus, whom ever good lordship in his blessed keeping. Written at Langley with the rude and simple hand of your assured and faithful orator and as one ever at your commandment, next unto the King to the uttermost of my little power. William employed his brother, Francis Bassett – a servant to Thomas Cranmer, archbishop of Canterbury, to physically remove the statue. The statue was removed, its receptacle heavily defaced and further pilramages and offerings were outlawed. On 1st September, Thomas Thacker, Steward to Cromwell, wrote to his Master telling him that Francis Bassett had delivered to Austin Friars (Thomas Cromwell’s main residence) in London, “the image of Saint Modwyn with her red cow and her staff which women labouring of child in those parts were desirous to have with them to lean upon and to walk with“. This is the best available description of the object. Thomas Cromwell fell from grace a few years later and was arrested being accused of many crimes, most significantly treason. Cromwell was condemned to death without trial and beheaded on Tower Hill on 28 July 1540 (the day of the King Henry VIII’s marriage to Kathryn Howard). Following his death, an inventory was taken of his belongings which showed an extensive collection of treasures that had been confiscated from the church for supposed destruction. It has not been possible to identify the images of St Anne and St Modwen mentioned in the letter from Sir William Bassett. As the Dissolution continued, many great Abbeys such as Glastonbury, Shaftesbury and Canterbury which had flourished as pilgrimage sites were reduced to ruins. Some were gifted to the Kings most ‘loyal subjects’. In 1539, Abbot Edys was finally forced to surrender Burton Abbey. Rather than being destroyed like most abbeys, it was later gifted, together with extensive grants to lands including what is now Cannock Chase, to Sir William Paget (pictured) – a close adviser to Henry VIII who later became 1st Baron Paget of Beaudesert. This fortunate survival left the abbey one of the largest in the country. The abbot’s probate jurisdiction in Burton also passed to the Pagets, who continued to exercise it until 1858. In February 1539 Dr. John London was at Burton and on 14th November the abbot and community surrendered their house and its possessions to Dr. Thomas Legh. Pensions ranging from £6 13s 4d to £2 were assigned to 7 monks: 5 priests, a deacon, and a novice. The abbot and probably four remaining monks became members of the new college at Burton which was already being planned, though it was not actually founded until 1541. Robert Heathcote, one of the deacons, and Humphrey Cotton, the novice, were recorded as in receipt of their pensions when they died in 1552 and 1563. A descendent of William Paget became the 1st Marquess of Anglesey in 1815. The title still exists and the current Marquess still has title to most of the land in Burton.